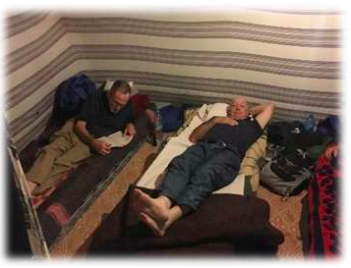 resting before we went out to meet the people who would be directing our excursion into the desert. Of course we also wanted to see the camels, and to learn what kind of grouping we would be in as we made our way to the camel bivouac. to what the distance is, but I would estimate about two miles. It’s plenty far enough for city dudes like us who have not been spending any time riding horses, or even bicycles for that matter. Seeing the tents and arriving at our destination was a welcome sight. that we were being “managed” as one group of four. We had our own guide and he introduced us to the four camels we would be riding. Assigning Tim to the first, me to the second, Mark to the third, and Bob to the fourth, each camel was attached to the one it followed with a lead rope of 10 or 12 feet. 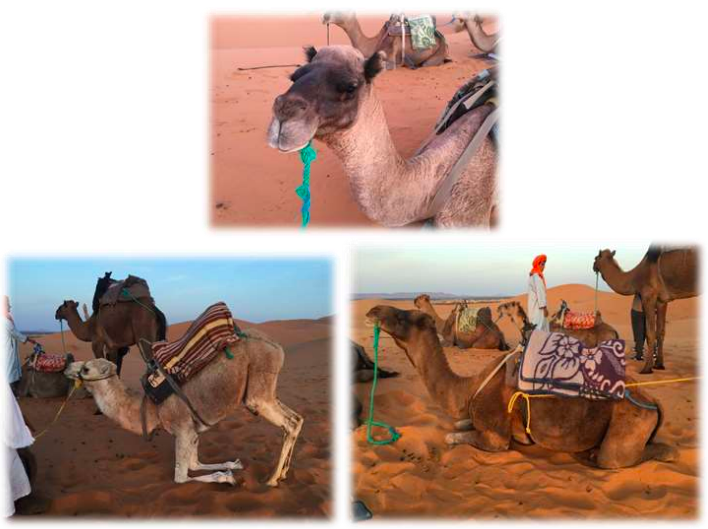 The guide had a rope attached to Tim’s lead camel of similar length and he walked that distance in front of him, slowing down at appropriate times as we approached a basin of sand in one of the dunes or started up an incline. The camel saddle is not particularly comfortable, there are no stirrups, and the hand-hold is an iron T-bar that is attached to the saddle and is 8 or 10 inches above the place where it is attached. loping walk, with the camel often having to take an extra short step to get better footing in the sand. I am happy to report that all of us managed to make the trip out and back without falling off, and without embarrassing ourselves too much in getting off and on the camel saddle. By far, the most precarious part of that exercise is when the camel stands up after mounting, and lies down before the rider dismounts. 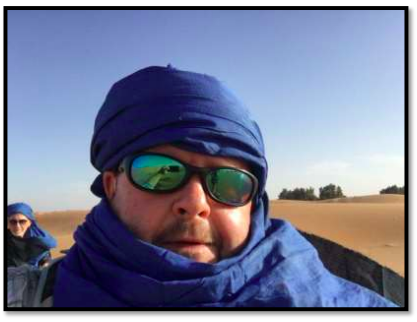 Here is a selfie of Mark, Bob in background after we had put on head scarves to protect us from the sun on the trip into the desert. Below is a selfie Tim made which show the other three riders following. Beside it is our barefoot guide. individuals. The guide seemed to have no difficulty in remembering exactly where we needed to go, and all the turns and changes in direction seemed to be correct. To me, it all looked radically similar, and I would have been hard pressed to even suggest the direction we need to take when we started the return trip. As the wind blows, the crest on the dunes as in this picture here is constantly changing. The undulations of the sand appear to be the creation of a graph of a higher degree curve, drawn with precision and without hesitation. Notice the edge of the “bowl” in the picture. sand and would serve as our mattress. by the three or four crew members who accompanied us. additional guests of the hotel who made the excursion. by a small troupe of Saharaoui Berbers who sang the folk music and demonstrated the dance of their local tribe. It was interesting but their repertoire seemed to be a little thin. I actually decided to depart before the music ended in order to engage in a bit of star gazing. we arrived at the tent. Furthermore, the clouds eclipsed one of the advertised attractions of being in the desert: the chance to observe the stars without the light pollution that is often the case in a more populated environment. This year was much different! For the first time in my life, I really saw the Milky Way. The band of uncountable stars across the middle of the sky was an awe-inspiring natural phenomenon that I felt very fortunate to see. The solitude and silence were intensely moving. I sat there for about 45 minutes, genuinely enjoying a very unique experience of contemplation and reflection. I realized why many people consider spending time in the desert in a quest for greater spirituality. For me the notion that a Creator of the limitless cosmos I viewed and the serene peace I felt, confirmed that the God of the universe was right there present with me, in a real and steadfast way. Gratitude appeared as the overriding emotion I felt knowing that I was loved and accepted. Much too early it seemed, about 6:00 a.m., the handlers were rousting us to get ready to return to the hotel. It was still pretty cool, but we had brought jackets and were adequately prepared. Within a half hour or so we experiencing the sunrise from the backs of our camels. circumstance, whether or not a wise man could be found among the four. We made it back to the hotel where we were able to shower and enjoy a nice breakfast provided for us. days of enjoyable familial fellowship.